In the wake of general elections, Narendra Modi led government announced an interim budget 2019-20 on February 1, 2019. The Interim Finance Minister Mr. Piyush Goyal laid down NDA Government’s ‘Ten-Dimensional Vision’ for the next decade. The government envisions a modern, technology driven, high growth, equitable and transparent India. The focus of the interim budget has been on poor and backward classes, farmers and labour, with proposals for budget allocations towards various new schemes aiming at uplifting/ supporting them. According to Rakesh Nangia, Managing Partner, Nangia Advisors “Budget 2019 is a revolutionary Interim-budget Deviating from the past practice and acknowledging the country need not wait for reforms to be implemented, the FM announced block bolstered relief to middle strata of the population from direct taxes and addressed the concern of the farmers and rural economy”. 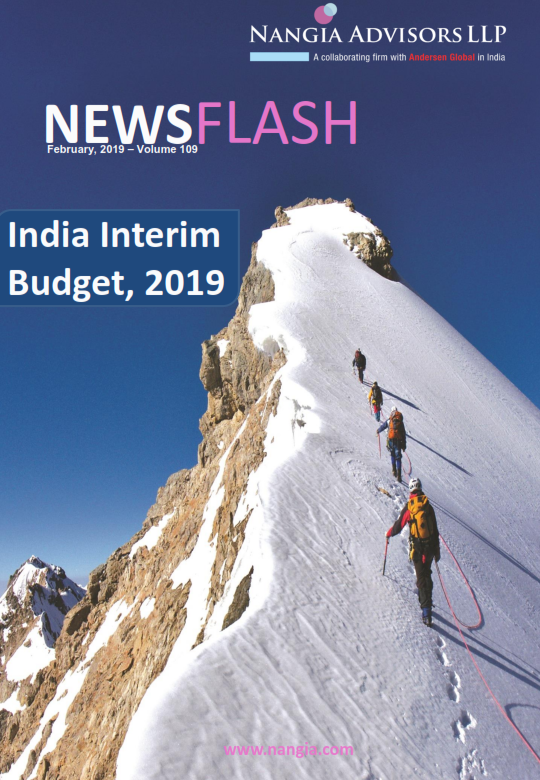 Please find attached India Interim Budget, 2019 – An analysis of the tax proposals summarizing the key proposals on direct and indirect taxes, along with sector wise impact of the same.